Over half the world’s human populations are currently at risk from vector-borne diseases (VBDs), and the heaviest burden is borne by the world’s poorest people, communities, and countries. The aim of this study was to conduct a review on VBD interventions relevant to housing and hygiene (including sanitation and waste management) in urban areas. We conducted a scoping review, which involved systematically searching peer-reviewed and grey literature published between 2000 and 2016 using five scientific databases and one database for grey literature. Different data extraction tools were used for data coding and extraction. 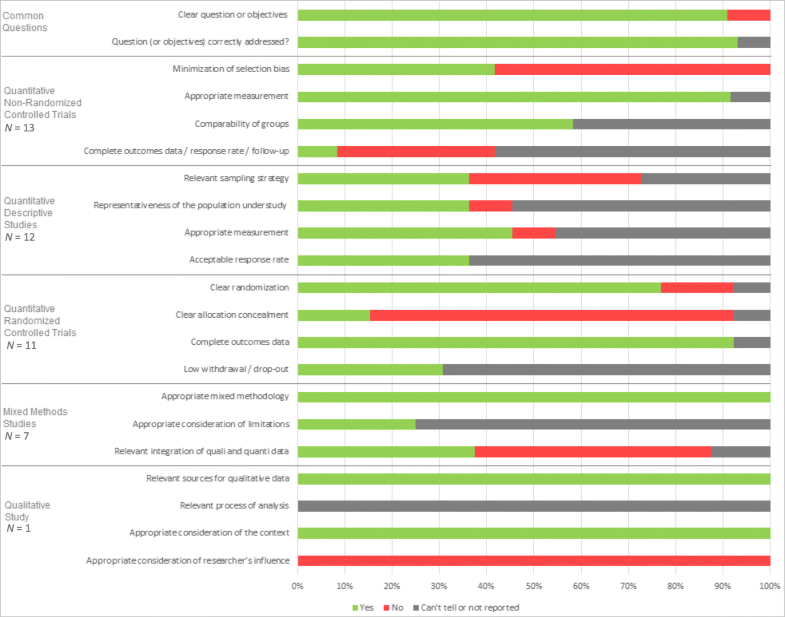 We assessed the quality of each study using the Mixed Methods Appraisal Tool and extracted descriptive characteristics and data about implementation process and transferability from all studies using the Template for Intervention Description and Replication and ASTAIRE (a tool for analyzing the transferability of health promotion interventions) tools. We reviewed 44 studies. Overall, the studies were judged to be of high risk for bias. Our results suggest multifaceted interventions, particularly community-based interventions, have the potential to achieve wider and more sustained effects than do standard vertical single-component programs. The evaluations of multifaceted interventions tend to include integrated evaluations, using not only entomological indicators but also acceptability and sustainability indicators. This review highlighted the important need for higher quality research in VBDs and improved and standardized reporting of interventions. Significant research gaps were found regarding qualitative research and implementation research, and results highlighted the need for more interventions focus on sanitation and hygiene practices. Over half the world’s human populations are currently at risk from vector-borne diseases (VBDs), and the heaviest burden is borne by the world’s poorest people, communities, and countries . Thus, VBDs are disproportionately high in low- and middle-income countries (LMICs) in tropical and subtropical regions, where medical resources for the population are often limited . These diseases also exacerbate poverty, given that illness and disability prevent people from working and supporting themselves and their family, causing further hardship and impeding economic development [3, 4]. The prevention and control of VBDs is not only a health matter but is also essential to improve the socio-economic conditions of LMICs. The discovery and massive use of residual insecticides targeted at mosquito vectors began in the 1940s and greatly contributed to the success of early vector control campaigns in the Americas, Pacific islands, and Asia . Over several decades, certain VBDs were effectively controlled, and by the 1960s, VBDs were no longer considered significant public health problems outside of Africa. Unfortunately, the benefits of such programs were short-lived, and during the 1970s Aedes aegypti (the vector for dengue, chikungunya, and Zika viruses) re-infested most of the countries where it had been previously eliminated . This led to a transition in public health strategy that was initially focused on eradication to one of control. In the absence of vaccines and prophylaxis options, a vector control strategy is the only preventive strategy for VBDs at the moment, with the exception of malaria and dengue vaccines that are being used in small scale contexts. . Unfortunately, we continue to experience an expansion of vector populations, which are becoming increasingly resistant to insecticides . Despite failures of past attempts at vector eradication campaigns and important indications of resistance, mass spraying and larvicides remain the principal control method used in routine practice and in outbreak situations . There is a critical need for alternative preventive measures that are effective and sustainable for VBDs. Multiple factors influence the geographical dispersion of VBDs, such as environmental changes and globalization, with perhaps the most important drivers being the global population explosion associated with unplanned urbanization . The United Nations Department of Economic and Social Affairs (UNDESA) reports that 54% of the world’s population lives in urban areas and is projected to reach 66% by 2050 . LMICs will continue to experience an unprecedented pace of urbanization with unplanned urban growth, posing significant challenges for human health and sustainable development . Rapid urban growth is dramatically surpassing the capacity of most cities in LMICs to provide adequate water and sanitation services for their citizens . Progress has been made since 1990, with the number of people gaining access to improved sanitation rising from 54% to 68% globally , although there remain important inequities in access along the sociodemographic spectrum [13, 14]. Consequently, in rapidly growing urban slums, VBDs and other neglected tropical diseases are thriving . Urban slums are characterized by high population density, absence of urban planning, unsustainable housing, inadequate infrastructure for water and sanitation, and poverty. The proliferation of water containers, which are used to cope with disruptions in piped water access or to collect rainwater, and also discarded items such as used tires, provide plentiful breeding sites for mosquitoes in urban slums, increasing the risk of transmission of several VBDs. The objective of the present study was to conduct a scoping review to synthesize existing evidence on VBD interventions in urban environments related to housing, hygiene, sanitation, and waste management measures. The purpose was to identify the extent of the literature and to determine the research gaps and priorities for future research. This study is part of a larger series of six scoping reviews conducted by the the “VEctor boRne DiseAses Scoping reviews” (VERDAS) consortium. The protocol of the VERDAS consortium is published  but briefly we used an eDelphi survey to select the six topics considered of highest priority by a panel of 84 international experts (43% researchers; 52% public health decision-makers; 5% from the private sector). The eDelphi was a three-round process: 1) panelists suggested topics to be considered; 2) panelists then rated the more than 80 suggested topics from “1–eliminate” to “5–top priority”; and 3) the 20 subjects rated 4 or 5 by more than 65% of the participants were rated a second time. By the end of the third round, the present topic had obtained the mean rate of 3.88 ± 1.07 and ranked the sixth (63.27% of panelists rated it 4 or 5). Our search strategy was validated by a public health librarian at the University of Montreal. We conducted a systematic literature search using four scientific electronic databases (PubMed, Embase, Global Health, and the Cochrane Database of Systematic Reviews) and one grey literature database (WHO library database). Finally, we searched reference lists of included articles to find additional relevant articles. Our search strategy consisted of the following combinations of key concepts “Vector-borne diseases” AND “Urban area” AND “prevention and control” AND [“housing” OR “hygiene” OR “sanitation” OR “waste management”]. We included all possible associated keywords to each key concept and appropriate descriptors for each database (see complete search strategy in Additional file 2). In a pilot round of screening, three reviewers (SD, NK, DD) independently screened and evaluated the relevance of the titles and abstracts of 20 references. This enabled the development of post hoc eligibility criteria and ensured consistency between the two reviewers (NK, DD) in the selection of studies. These criteria were consistently applied during the full process of screening. After the independent title and abstract screening by two reviewers (NK, DD), the full texts of the included articles were screened by the same two reviewers. A third reviewer (SD) resolved any discrepancies at each stage of the selection process. The inclusion criteria were: 1) presents an intervention within a routine context, as opposed to an intervention in response to an outbreak; 2) presents an intervention focused on housing and/or on hygiene (including sanitation and waste management); 3) based in an urban context; 4) published between January 2000 and July 2016; and 5) language of publication: English, French, or Spanish. Articles were excluded if they: 1) included only epidemiological or prevalence data without a link to a specific intervention; 2) included only entomological surveillance without a link to a specific intervention; 3) used an experimental design to evaluate effectiveness of potential/new vector control measures (dose-effectiveness studies); or 4) were not available in full text versions. Items that were not original research (e.g. reviews, comments, editorials) were excluded, but references lists were checked for potential relevant original studies. We defined key concepts to assist with applying the selection criteria. ‘Vector-borne diseases’ (VBDs) are illnesses caused by vectors such as mosquitoes, ticks, and lice that transmit infective pathogens (bacteria, virus, and fungus) from one host (human, birds and animals) to another . We based our list of VBDs on the list provided by the World Health Organization (WHO) . To select interventions specifically within an urban context, we used data from the 2014 World Urbanization Prospects issued by the Population Division of the UNDESA to determine urban populations according to criteria set by each specific country . We adopted the operational definition of ‘infection prevention and control’ from WHO: “Infection prevention and control measures aim to ensure the protection of those who might be vulnerable to acquiring an infection both in the general community and while receiving care” . In accordance with this definition, we focused on interventions occurring within a routine context rather than in a massive and/or emergency response to an outbreak. We therefore included studies that contained interventions focused solely on the reduction of vector populations, even if no specific epidemiological data were provided, as long as the intervention was population-based and not in experimental conditions. Moreover, we focused on interventions relevant to one or the other of two key concepts: 1) housing: defined as an intervention taking place in a housing unit, defined as “a place…intended for habitation by a single household, or one not intended for habitation but occupied as living quarters by a household” ; 2) hygiene: defined by WHO as “practices that help to maintain health and prevent the spread of diseases”, including environmental cleaning, personal hygiene, and sanitation . The term ‘sanitation’ refers to the maintenance of hygienic conditions, through services and actions required for proper handling of waste materials, such as garbage collection and wastewater disposal . We used a standardized Excel (Version 2016, Microsoft Corporation, Richmond, WA, USA) spreadsheet template across our consortium to extract information from included studies. The data extraction consisted of five sections: 1) descriptive characteristics of the included studies; 2) methodological quality assessment using the Mixed Methods Appraisal Tool (MMAT) ; 3) macro data extraction using the Template for Intervention Description and Replication (TIDieR) tool ; 4) micro data extraction using the ASTAIRE tool (a tool for analyzing the transferability of health promotion interventions) ; and 5) additional columns such as ‘challenge faced’ and ‘recommendations’. Our search strategy yielded a total of 5775 citations (3995 from five electronic databases and 1780 from grey literature). That number was reduced to 3066 after excluding 2709 duplicate records. After screening the abstracts of all 3066 citations, we retained 378 articles for full-text screening. A final set of 44 articles met all inclusion criteria and were included in our review. Figure 1 presents the Prisma chart of our study selection process. The descriptive characteristics are presented in Table 1, where the included studies are classified as either single-component (n = 24; 55%) or multi-component interventions (n = 20; 45%). We defined the former as interventions based upon only one activity and the latter as referring to a set of simultaneous or sequential activities. This classification was inductive and decided upon after the data extraction to guide the presentation of results and to highlight key differences in complex interventions. Of the 44 studies, 38 were published in English (87%), five in Spanish (11%) and one in French (2%). The geographic zones predominantly under study were Latin and Central America (n = 12; 27%), the Caribbean (n = 9; 21%), and Asia (n = 10; 22%), followed by North America (n = 6; 13%), the Middle East (n = 3; 7%), Africa (n = 2; 4%), Oceania (n = 2; 4%) and Europe (n = 1; 2%) (Fig. 2). Almost all studies were focused on mosquito vector populations (n = 41; 93%); only three studies were based on other vector populations: two on sandflies and one on fleas (and, by proxy, rats). Fewer than half of the studies (n = 17; 39%) were focused on one VBD, with dengue being the predominant focus (n = 11; or 65% of VBD-specific studies) [6, 25–34], followed by malaria (n = 3; 17%) [35–37], leishmaniasis (n = 2; 11%) [38, 39], and plague (n = 1; 5%) . More than half of the studies (n = 27; 61%) did not address a specific VBD and instead used indicators only from the vector population. The majority of non-VBD-specific studies were focused on Ae. aegypti (n = 20; 74%) [41–60], which is a primary vector for dengue, chikungunya, and Zika transmission. Therefore, there were a total of 31 papers (70%) focused specifically on VBDs transmitted by Ae. aegypti. There was heterogeneity in study designs (based on the MMAT classification), which included 13 quantitative randomized controlled trials (RCT) (30%) [28, 30, 38–40, 42, 47, 48, 53, 55, 59–61], 12 quantitative non-randomized controlled trials or observational studies (27%) [25, 31, 35, 37, 41, 43, 44, 46, 62–65], 11 quantitative descriptive studies (25%) with no control group, using a pre/post design approach [6, 26, 27, 32, 45, 49, 50, 54, 56, 66, 67], seven mixed-methods studies (quantitative and qualitative data) (16%)—among which five were cluster randomized controlled trials [29, 51, 52, 57, 58], one a non-randomized controlled trial  and one a descriptive study —and, finally, one qualitative study . Of note, almost all mixed-methods studies were multi-component studies [29, 34, 51, 52, 57, 58], and only one was single-component ; also, mixed-methods was the most frequent design for multi-component interventions (n = 6; 30%), with the same number of RCT studies (n = 6; 30%), whereas in single-component studies, the majority were quantitative non-randomized controlled trials or observational studies (n = 10; 42%). There were no clear temporal trends in publishing dates, with 50% of the studies being published in the first half of our timeframe (2001–2008) and 50% published in the second half (2009–2016). Overall, the included studies were assessed as having high risk for bias in the majority of the studies (Fig. 3). Four studies (9%) did not clearly state the study objectives and consequently, it was not possible to assess whether the objectives were correctly addressed [32, 41, 56, 62]. Four studies (9%) were rated as being of low risk for bias, with all indicators being positive (yes) [6, 30, 49, 51], while three (7%) were rated as very high risk for bias, with no positive indicators [56, 66, 67]. The remaining 36 (82%) studies were rated as moderate to high risk for bias, with at least one indicator positive [25–29, 31–48, 50, 52–55, 57–65]. When information was missing or lacked clarity in description, such as not reporting response rates or the presence of allocation concealment, the indicator was labelled ‘cannot be determined’. Figure 4 illustrates to what extent the interventions were described in each study, following the TIDieR checklist (see Additional file 3 for the complete extraction grid). Only a few elements were reported across all the studies: the reason for the intervention (‘why’), what the intervention was (‘what procedures’), the location (‘where’), the date and the frequency of the intervention (‘when and how much’), and some elements of context (e.g. geographic, climatic, previous outbreak events in the area). 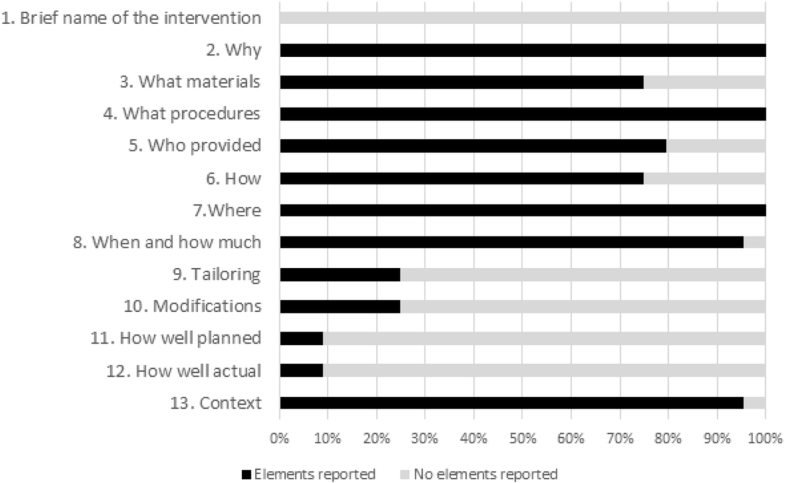 Other basic elements of the interventions were reported in 75% of the studies, such as: 1) exact materials used (‘what materials’), as in Winch et al., who provided an image of the poster they used during the intervention ; 2) description of the providers (‘who provided’), as in Healy et al., who clearly described the providers, AmeriCorps volunteers ; or 3) the mode of intervention delivery (e.g. person-to-person, group meetings) (‘how’), as in Vanlerberghe et al., who specified that: “During distribution, at least one person in every household received information on the use and maintenance of the insecticide treated materials through person-to-person communication” . Eleven studies (25%) included information to explain potential customization or tailoring (or not) [6, 25, 29–31, 33, 43, 51, 53, 57], such as Andersson et al., who wrote that “each community chooses and implements its own mix of dengue prevention actions based on local vector reservoirs and community resources” . Also, 11 authors (25%) provided information on modifications made due to external factors [6, 25, 36, 37, 42, 43, 46, 55, 57, 58, 65]. For example, Wai et al. described how a cyclone postponed all intervention activities, which occurred after a municipal campaign response including mass larviciding of water containers . Lastly, regarding the process for evaluating the intervention, such as its fidelity (‘how well planned’ and ‘how well actual’ fidelity and adherence were assessed), four authors mentioned that the analysis was planned ahead of the intervention implementation [25, 30, 53, 58] and four authors provided information on fidelity [25, 53, 55, 57]. For example, Castro et al. explained that “in some intervention clusters, local actors introduced changes to the original design and, furthermore, the level of participation varied. This was documented in detail through process-oriented fidelity research that revealed important heterogeneity in the implementation” . Using the ASTAIRE checklist, we examined the availability of information for 23 elements related to the implementation process and transferability under four categories: population, environment, process, and elements needed for an intervention’s transfer (see Additional file 3, Fig. 5). Besides the intervention method, the elements most often reported were the epidemiological and sociodemographic characteristics of the population (60% of studies), the human and financial resources (50%), and partners enlisted (48%). Other aspects related to the implementation and transferability of these interventions were poorly described. For example, only five studies (11%) clearly provided information related to the perception of health needs within the community and how or whether these were taken into account [30, 31, 33, 35, 58]. Arunachalam et al. stated that there was a large demand for the water container covers from the community . Fifteen studies (34%) noted that the institutional environment could influence the interventions [6, 25, 29, 31, 32, 34, 37, 45, 50, 51, 54–56, 58, 65]; for example, as Abeyewickreme et al. described: “a close collaboration was established between volunteers and local government authorities with a long-term view for the sustainability of activities when funding of the project ceases” . Only two studies (5%) mentioned a theoretical framework to justify their approach . Pengvanich provided a clear definition of the term ‘empowerment’ based on Wallerstein and Bernstein  as “a method […] where the group members are given necessary tools to identify the problem and its causes and are encouraged to find suitable solution by themselves” . Subsequently, the author elaborated on the theory-driven design of the program, which was “specially designed based on the five-step learning process for empowerment (namely experiencing, identifying experience, analyzing, planning, and doing) which was created by Bishop [68, 69], and the participatory learning process which comprised experiential learning and group process” . Sanchez et al. provided a conceptual model of their educational strategy to enhance community participation  and mentioned that the evaluation of the participation was based on the framework developed by Rifkin et al. .
Table 2 presents findings of all 24 single-component interventions, subdivided into five sections according to types of intervention activities: 1) chemical applications (n = 7; 29%), such as insecticide spraying or larvicide distribution in water tanks [25, 35, 41–44, 66]; 2) source reduction of breeding sites for mosquito populations via direct removal of stagnant water and/or through educational activities (n = 7; 29%) [26, 27, 36, 45, 61, 62, 67]; 3) traps (n = 4; 18%), which include mosquito and flea/rat traps [40, 46–48]; 4) nets (n = 3; 12%), which include bed nets, windows screens, and/or tanks covers [28, 49, 50]; and 5) biological agents (n = 3; 12%), such as fish that eat mosquito larvae or neem oil to repel sandflies [38, 63, 64]. Involvement of field staff in designing and operationalizing entomological surveillance is important. Street catch basins are important breeding sites and their targeted control could help to decrease dengue transmission, especially in a context of hyper-endemicity such as Buga. Insecticide-treated mosquito window and door curtains, along with legislative measures, may provide cost-effective (< USD 1) concurrent control of mosquitoes and other domestic pests. Control of Ae. aegypti in surface container is not sufficient to prevent dengue transmission. Visual detection of aquatic habitats of Ae. aegypti is not sufficient to assess adult mosquito productivity and thorough assessments of all public services can guide entomological surveys of Ae. aegypti. • Single application at full label rate = ↓ 72.7 ± 5.4% mosquitoes recovered in traps. Night time ULV adulticiding is effective in reducing Ae. albopictus abundance at mid-label rate with dual application. The use of ULV spray at front door is faster and more cost-effective since 1 spray operator could treat 75 houses in a day. It is suggested that diflubenzuron may prove to be more useful in septic tanks for effective control of Cx. pipiens than currently used organophosphate larvicide. • 5 troughs (0.71%) with an average of 6.4 pupae/trough. The population should be informed that drinking water should be replaced daily to decrease the number of breeding sites and at the same time improve the animals’ health. Individual health education was effective in improving the practice of source reduction in a community with poor knowledge of vector biting and breeding habits. Accessibility and availability of material does not guarantee its use. Installation of a water supply system = ↓ number of water storage containers, such as plastic buckets and water jars. But remaining containers were still an important source of Ae. aegypti pupae. • Community education included:  door-to-door active education (actively walking around the front and back yard with the resident, describing current and potential mosquito habitats + distributing educational material),  tire pick-up days,  trash can drilling days, and  media releases. Recommended that an active education campaign could better promote source reduction behavior in the community to prevent peridomestic mosquitoes, rather than of passive education measure (distribution of pamphlets). Print educational materials may have unintended negative effects on resident attitudes and household management of mosquito production. Recommended that vegetation management and maintenance of the concrete structures and waste inflow to waste stabilization ponds be improved in areas with a risk of mosquito-borne diseases. Kartman bait-boxes reached the rat borne and the vectors of plague found in urban area. This method can be used extensively both during epidemic and inter-epidemic contexts. AGO traps were useful and inexpensive mosquito surveillance devices compatible with other control measures. Chemical treatment using C21 attracticide has potential for surveillance and management of dengue and chikungunya mosquitoes. Recommendation for improvement of C21 delivery system, currently liquid formulation, but tablet formulation would be a better option. deltamethrin outside and 5 LOs inside households (kitchen, bathroom, living room and each bedroom). LO is not designed to be sole dengue control vector; rather, meant to be integrated with other VBD control methods. Insecticide-treated bednets had an immediate effect on dengue vector populations after their introduction, and over the next 5–12 months, the presence of ITNs may have continued to affect vector populations and dengue transmission. • 2nd survey: ↓ infestation levels but dramatic ↑ in productivity in almost all container types. Metal drums were covered. Long-term ↓ in female mosquito density. Large containers used by households for water storage were often key mosquito breeding containers where piped water distribution is irregular. Recommended that netting the most productive containers produces a drastic and long-term reduction in adult mosquito density without using chemical treatments. ITMs in housing can result in significant reductions in Ae. aegypti levels when dengue vector infestations are moderate, but the magnitude of the effect depends on the coverage attained, which itself can decline rapidly over time. Neem oil extract acts as a biopesticide and may be a good alternative for effective vector control of leishmaniasis. Other benefits include complex structure of azadirachtin, which makes it difficult for insects to develop resistance. Predatory fishes are appropriate for long term control of Culex pipiens in human-made aquatic habitats but chemical, physical, and biological characteristics of the water are important determinants of the success of this method. • Larvivorous fish obtained from local rivers deposited in water tanks for non-human consumption (3 fish/container, 2 females and 1 male). • Able to prevent 89% of breeding deposits. Recommended to use local species of fish only. Table 3 presents findings of all 20 multi-component interventions, divided into community-based approaches (i.e., community mobilization) (n = 15; 75%) [29–34, 37, 51–58] or vertical approaches (n = 5; 25%) [6, 39, 59, 60, 65]. Vertical approaches refer to the more ‘traditional’ means by which most health programs and policies are delivered to populations; they do not involve the community in planning or designing the intervention . In community-based approaches, on the other hand, community representatives and/or entire communities are involved in planning and/or designing the intervention . •↓ malaria infection in intervention neighborhoods vs pre-cleaning period (OR = 0.12, 95% CI: 0.05–0.3, P < 0.001). 4 elements are needed for sustainable environmental management: i) political will and commitment, ii) community participation, iii) financial resources iv) and inter-sectoral collaboration. • Raising awareness on solid waste management among multi-stakeholders + improving garbage collection with the assistance of local government. •Awareness program and cleaning campaigns for school children in 8 schools. • Women identified as key actors in the entire process of cleaning homesteads and solid waste management at household level. The mobilization of the community was essential for the successful implementation and sustainability of the programmes. Coordination of local authorities and increased household responsibility is vital for effective and sustained dengue control. -Volunteers received training as organizers and educators. • 2-day workshop for family leader about prevention and control of dengue and to provide a family leader’ activity manual. • Community leaders invited to discuss problems and obstacles involved in implementing dengue preventive programs and to suggest solutions. •Family leaders were asked to practice the knowledge gained and to record their behaviour in record form. It was recommended that the family leaders when well trained are capable of carrying out the vector control protocol effectively. •Radiobroadcasts and house visits for education of source reduction and awareness of dengue risks. • Community training for elimination of breeding sites. • Most abundant breeding sites = tyres and drums. Tins, flower vases, plant containers, shells and others were of secondary importance. • ↓ CI from 33 to 5% for rubber tyres and from 42 to 8% for drums. • ↓ BI (Ae. aegypti) from 29 to 0. • ↓ BI (Ae. albopictus) from 44 to 4. • Community working group (CWG) coordinate and implement actions to community level. • Learning group met quarterly to exchange and analyze experiences, and to develop proposals, reformulation of the work of the CWG. •Educational pamphlets and other educational material. Educational activities are effective to promote behavior change and raise awareness. • ↑ use of aerosol insecticides with the parent’s exposure to Posters. • 17 meetings with multiple stakeholders to discuss vector control activities + mobilization of women’s self-help groups for clean-up campaigns. •Involvement of community to distribute water container covers and culturally and linguistically relevant health education materials. •Mobilization of school children regarding dengue prevention and environmental sanitation. •Fostering of waste disposal and recycling measures to eliminate small discarded containers. • ↓ PI to 0.004 from 1.075 (P = 0.020). • ↓ CI to 1.05% from 8.91%. vector and disease transmission was enhanced significantly (P < 0.05). A community-based approach and alliance with multiple stakeholders led to a substantial reduction in dengue vector density. The most prominent benefit was the satisfaction created by ‘working together’, expressed during the in-depth interviews. •Covering elevated containers and in-house rubbish disposal without larviciding + source reduction of productive container. •↑ knowledge of dengue and willingness to participate in preventive actions. The results showed the effectiveness of the intervention package in comparison with the routine control programme. It is recommended that such a participatory eco-health approach offers a promising alternative to routine vector control measures such as larvicide treatment or space spraying without any social participation. The empowerment strategy increased community participation and effectiveness of intervention than only routine Ae. aegypti control. • Ovitrap index ↓ from 66.7 to 39.3% 3 months after the campaign (P < 0.05). • Significant improvement in behaviour of source reduction after campaign (P < 0.05). The study recommended that a short-term community-based cleanliness campaign is an effective alternative to rapidly reduce the sources of dengue vector at the onset of a new epidemic. • + containers lids: ↓ PI 71% vs 25% for control (P = 0.01). The results indicate that the intervention package can reduce dengue vector density. Successful and adequate use of the intervention packages should be enhanced through appropriate social mobilisation to achieve long-lasting behavioural change. • Series of meetings and workshop for the community on dengue fever, its prevention and control. • Mobilization for waste removal (garbage bags; old car tyres management; lories for waste collection). Vertical programmes run by the health sector without community participation will struggle to be successful. Instead, programmes that develop horizontal partnerships, with community committees, will encourage community action and lead to more successful and sustainable outcomes. •Action plans varied between circumscriptions including activities such as  locally designed social communication intending to mobilise the population and change behaviour;  negotiations with community and governmental inter-sectoral groups to eliminate environmental risks outside households;  surveillance of environmental risks with locally produced and periodically updated maps;  visits by teams of community members to houses with repeated Aedes infestation. • PI: 0.27 (0.09 to 0.76). • A community based environmental management strategy embedded in routine control program is effective. •Vector control tools applied according to the type of container and peoples’ preferences: chemical (insecticide), mechanical (cover nets), biological (dragon fly nymphs) + waste-collection bags for removing discarded small containers. • Combined measures most frequently favoured (44.8%), then chemical (34.2%) and mechanical measures (16.5%). • Massive larviciding programme in response to cyclone struck happened during the study and the intervention programme was as good in ↓ vector densities as the massive larviciding in the routine service areas: ↓ PPI from 0.34 to 0.23 (32% reduction) in intervention clusters and from 0.33 to 0.15 (54.5% reduction) in routine service clusters. In terms of sustainability and empowerment of communities and other stakeholders, the partnership approach with targeted containers interventions was found to be superior to the vertical approach. • Health education messages were relayed to encourage use of bed nets and curtains, to explain the role of sand flies in transmission of ACL during the distribution via face-to-face and focus groups. Combination of the 4 strategies was effective in reducing the number of eggs and a high level of public cooperation was obtained. Door-to-door communication programme can have a long-term effect on the behaviour of the population. • Water tanks and drums/barrels treated with larvicide Natular DT. Inter-sectorial integration with the community for an educational campaign is an effective measure and use of chemicals (ULV) should be reserved for epidemical outbreaks. Regardless of the type of intervention, 42 studies (95%) used at least one of the following entomological indices to assess intervention effectiveness: container index (CI: percentage of water-holding containers infested with larvae or pupae) in 24 studies (55%) [25, 26, 28–32, 34, 37, 41, 45, 47–49, 51, 52, 55, 58–61, 63–65, 67]; Breteau index (BI: number of positive containers per 100 houses inspected) in 15 studies (34%) [6, 28–30, 32, 34, 42, 50–53, 55, 57–59]; house index (HI: percentage of houses infested with larvae and/or pupae) in 13 studies (30%) [6, 28–31, 33, 35, 48, 51, 52, 57–59]; pupae per person index (PPI: number of pupae per number of inhabitants) in nine studies (20%) [29, 30, 49–52, 55, 58, 59]; traps positivity (percentage of traps found positive) in seven studies (16%) [28, 38–40, 43, 46, 54]; indoor resting adult mosquitoes (based on manual collection with vacuum) in six studies (14%) [41–44, 48, 66]. Nearly half of the studies (n = 21; 48%) included at least one of the following population-based indicators: assessment of concern or perception changes (n = 8; 18%) [30, 33, 37, 52, 53, 55, 58, 61]; willingness or actual participation or degree of involvement in the intervention (n = 7; 16%) [29–31, 51–53, 57], as well as use of the tools provided (e.g. 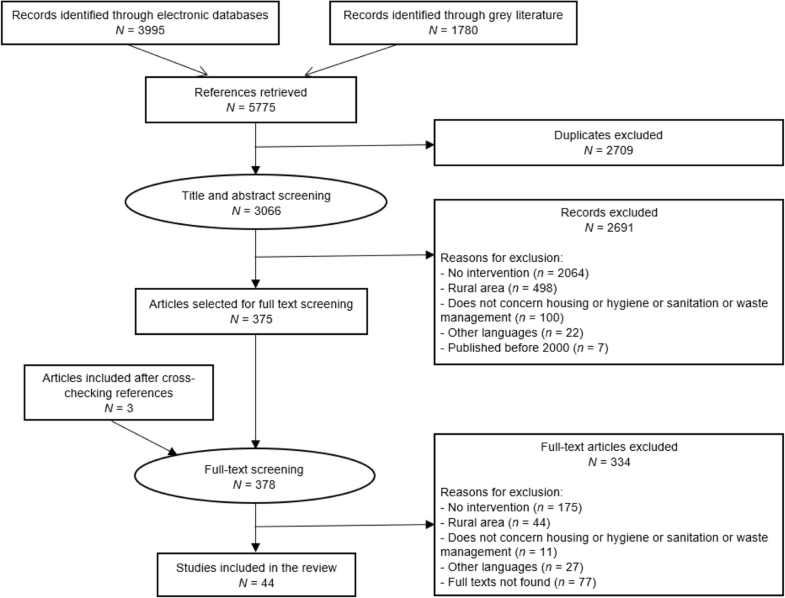 nets, educational activities) (n = 6; 14%) [28, 36, 37, 39, 50, 55]; changes in behaviours, such as self-reported or objectively measured source reduction or healthcare seeking during febrile episode (n = 7; 16%) [27, 34, 36, 53, 54, 60, 62]; knowledge and misinformation assessment (n = 7; 16%) [27, 34, 39, 51, 53, 54, 60]; and acceptability elements (n = 4; 9%) [33, 35, 52, 58]. Only 25% (n = 11) of the studies that used epidemiological data collected primarily serological data or data from local surveillance systems to assess the effects of the interventions on specific VBDs. It was not always clearly stated whether the cases were clinical or laboratory confirmed cases. Half of the studies (n = 22, 50%) [26, 27, 32, 38, 40–49, 56, 59, 62–67] used indicators only from one of the above categories (entomological, population-based, or epidemiological), while the other half (n = 22, 50%) used indicators from more than one category [6, 25, 28–31, 33–37, 39, 50–55, 57, 58, 60, 61]. The majority of the single-component intervention studies (n = 18, 75%) used indicators from only one category [26, 27, 38, 40–49, 62–64, 66, 67], while 16 (80%) of the multi-component intervention studies used indicators from multiple categories [6, 29–31, 33, 34, 37, 39, 51–55, 57, 58, 60]. Only eight studies provided information regarding the costs of the interventions [37, 39, 46, 50–52, 55, 67], and no study included a complete economic evaluation, such as a cost–benefit evaluation. Mostly, authors included minimal information, such as Arunachalam et al., who wrote: “Netted frames of three sizes (small, medium, and large) were made locally by sub-contractors and the cost was USD 8 per cover” , or Caprara et al., who included human resources costs in the intervention cost estimate: “the total costs of the intervention was USD 18.89 per house” . Almost all the studies (95%) reported at least one positive indicator of intervention effectiveness. The only two studies reporting null or negative results were single-component interventions. Barrera et al. , in Puerto Rico, reported no effect on the density of adult mosquitoes resting indoors with the intervention consisting of source reduction of breeding sites and application of larvicide. The authors later showed that septic tanks (not targeted by the original intervention), significantly contributed to the maintenance of dengue virus endemicity in the region, with an estimated productivity of 4.4 Aedes aegypti adults/person/day (based on three persons per household). Bodner et al. (2016) observed a negative effect of their educational intervention, characterized by a decrease in concern for VBDs with no change in mosquito infestation rates or breeding site rates post-intervention. The intervention occurred in the US and consisted of distributing educational print materials including a calendar, notepad, flyer, and magnet, all with pictorial and written mosquito educational information. The authors suggested this print-focused educational campaign was insufficient to reliably motivate resident-based mosquito habitat reduction and may even have had the unintended opposite effect, making residents less concerned. The lack of active community involvement in the campaign and the authors’ inability to evaluate whether recipients had actually read the materials were possible explanations for these unexpected results . Papers describing multi-components interventions were more to include descriptions of the challenges the research team encountered, in contrast to the single component intervention studies, which is likely due to their complex designs. For Gürtler et al., despite positive indicators of effectiveness, the intervention failed to maintain larval indices below targeted levels, for which they suggested seven possible reasons: 1) incomplete surveillance coverage; 2) limited residual efficacy of temephos; 3) permanent sites for mosquito breeding due to lack of change in the management of large containers for permanent water storage; 4) very favourable climatic conditions for Ae. aegypti; 5) limited source reduction efforts; 6) lack of regular perifocal residual spraying with insecticides; and 7) lack of adequate, sustained community participation beyond mere acceptance of regular control measures, for which there were high levels . These described challenges were not isolated to Gürtler et al. One of the most commonly cited difficulties involved the sustainability of the interventions without the support and resources of the research teams . This is difficult, as explained by Quintero et al., that despite initial success, intervention benefits can be forgotten and use of tools (e.g. nets) are discontinued . There is an important need for continual encouragement and monitoring of the implemented programs . Sustainability is also jeopardized by the need for significant investments of both human and financial resources for successful interventions, particularly for community-based interventions. This type of intervention requires increased time and resources compared to conventional institution-based interventions due to the longer socialization and negotiation processes needed to implement the intervention, to achieve social participation, and to respond to community expectations . It cannot be expected that community participation in vector control interventions is simple. As discussed by Caprara et al., the social participation of subjects and groups is often heterogeneous and shaped by historical and present-day community dynamics . For example, in their intervention in Brazil, “social participation was fragile in locations with nonexistent community organizations or in neighbourhoods with either a history of violence or very well off and privileged groups” . Intervention protocols that engage leadership and community members in discussing evidence and defining local strategies are a promising starting point for a wide range of settings to ensure community participation in vector control activities . Sites that implement interventions with their own approach have the advantage of local customization and strong community engagement, as demonstrated in the Camino Verde intervention in Nicaragua and Mexico . In addition to community participation, achieving and maintaining field staff motivation is a major challenge in vector control activities. As found by Ocampo et al. , resistance during intervention implementation can arise among field staff: “Although we found that the field technicians initially objected to counting pupae, once they were aware of the low productivity of mosquitoes in houses, they began to understand the importance of obtaining these data.” Thus, a lesson learned from this intervention in Colombia was “the importance of engaging field staff in designing and operationalizing entomological surveillance. At first, counting pupae and increasing the number of houses to be sampled was strongly opposed by technicians. During the training activities, an agreement was achieved to classify visually the number of pupae but other methods with a perceived lower workload could be developed.” The coordination of local authorities, along with increased household responsibility for targeted vector interventions, is vital for effective and sustained dengue control, according to Abeyewickreme et al. . Both Caprara et al. and Andersson et al. recommended expanding the coordination beyond local authorities, to include other sectors for sustainability. These sectors include education, local/municipal services such as water supply, garbage disposal, sanitation and street cleaning, culture, tourism, transport, construction, and public safety [30, 52]. A unique challenge was reported by the only study with negative results. Those authors concluded that print education materials may have had unintended negative effects on residents’ attitudes and household management of mosquito production, which resulted in no behavioural changes and decreased concern around VBDs . This was one of the few reviewed studies conducted in a high-income country (US), where population characteristics would be very different from those in the other studies; however, they were not detailed in this article. Anecdotally, the authors reported that when some of the residents understood that the most important mosquito-borne threat in the region under study (Washington, DC, and Maryland) was West Nile virus, they appeared less concerned about mosquito vectors, relative to other diseases with more negative media attention and greater public health impacts, such as HIV or Ebola . Moreover, Alvarado et al. (2006), in a post-intervention evaluation of population education, noted that accessibility and availability of material does not guarantee its use ; this might be one explanation for the negative results obtained by Bodner et al. , who were unable to evaluate whether people had actually read the educational materials provided. This review emphasizes the need for higher quality research and improved reporting of interventions for VBDs. The trend towards more multi-component and community-based interventions is promising for enhanced effectiveness and sustainability of vector control strategies, although such interventions present important challenges that need to be considered from the outset. Overall, the included studies were judged to be of high risk for bias, with the limited information provided. Context is a key as it is essential for understanding the elements needed to ensure successful interventions and to interpret the failures of previous interventions, which should be considered by researchers and implementers . In vector control strategies, communal water supply or garbage collection services are significant determinants that require consideration in the intervention and evaluation. Using checklists such as TIDieR and ASTAIRE would be valuable to guide authors towards thorough and standard reporting of interventions. Given the large heterogeneity of interventions, study designs, contexts, and indicators, it was not possible to pool the findings for an average measure of intervention effectiveness in the framework of a scoping review. Most of the studies measured their success using entomological indicators with only 25% using human morbidity indicators, despite the uncertain relationship between entomological indicators and the relative human morbidity indicators . Reduction of vector populations is essential, but even significant reductions do not prevent epidemics or endemicity . Thus, epidemiological assessment is essential to objectively evaluate an intervention’s effectiveness in reducing disease burden. 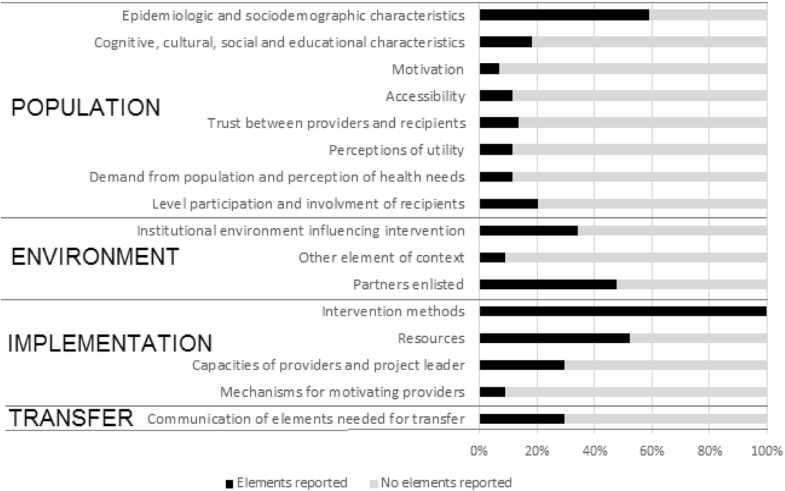 Community-based interventions often provide more complex evaluations based on a greater diversity of indicators, including acceptability, use of tools, behaviour changes, and/or knowledge improvement. As vector control interventions are implemented in complex contexts, their evaluation strategies should capture all the components needed to objectively evaluate real world interventions . The sustainability of vector control interventions is a key factor when attempting to scale-up research projects towards large-scale programs or policies . Intervention sustainability was a critical challenge highlighted in several of the reviewed publications. The limited durations of follow-up and the lack of rich, qualitative data made it very difficult to evaluate intervention longevity or to understand not only the social and cultural determinants of interventions, but also their implementation processes, adaptability, and customization . Thus, more implementation research is needed in VBD, including qualitative research methods with longer follow-ups to collect information on processes and sustainability. The multi-component community-based interventions included in this review showed promising results, with interventions producing larger effects than standard vertical vector control programs in terms of both reductions of mosquito populations and increased sustainability [29, 30, 51–53, 57, 58]. However, involving the community requires time and resources . Suitable organizations must be identified or created to guide the community involvement strategy and members of these organizations need training and support. The use of intervention packages should be enhanced through appropriate social mobilization to achieve long-lasting behavioural change  and with the active involvement of health promotion experts to inform to how change behavior. Theoretical frameworks are essential when designing and implementing health education programs, given the need to understand psychosocial factors underlying individual and community-level decisions and behaviours . Community-based programs show potential; however, the link between program outputs and vector presence is complex and generally unclear to which elements or specific actions an effect should be attributed . Despite this, making community-based programs more flexible and adaptable is important for the future success of vector control strategies . It is vital in the planning stages to identify the appropriate blend of core strategy components required to maintain effectiveness and the components that can be adapted and tailored to local conditions. The interventions were largely focused on solutions to minimize vector breeding sites with only three studies focused on sanitation interventions: domestic septic tanks (Turkey) , water supply systems installation (Viet-Nam) , and sanitization of waste stabilization ponds (Pakistan) . It is imperative to understand how improved sanitation infrastructure, including a stable potable water supply, results in reductions in vector breeding habitat and human morbidity. Moreover, including sanitation as an intervention would lead to more integrated disease management, as other pathogens (e.g. bacteria, parasites, viruses) and vector populations would be reduced. Importantly, only a few non-mosquito vector studies were included (sandflies and fleas) with dengue predominantly represented, revealing substantial gaps in VBD research in urban contexts. Another significant research gap is the under-representation of Africa as only two African-based studies were included: Madagascar  and Tanzania . West Africa, where countries are among the poorest and health problems are major , is completely absent in this review. Historically, VBD research in Africa has been dominated by malaria, which is considered a rural disease, and the significant malaria burden in Africa has often eclipsed other febrile illnesses [82, 83]. Despite our best efforts, we were unable to retrieve the full texts of 14 potentially eligible articles (based on title screening). We may have also missed relevant publications in languages not included in our review. In addition, the fact that our inclusion criteria focused exclusively on urban areas may explain the smaller number of studies included in our review from Asia and Africa compared to the Americas. It should be noted that the most urbanized regions are in North America (82% living in urban areas in 2014), Latin America and the Caribbean (80%), and Europe (73%). In contrast, Africa and Asia remain mostly rural, with 40% and 48% of their respective populations living in urban areas . The present review is also limited to published material and publication bias may influence some results presented in this review. Several knowledge gaps were identified in this review that need to be addressed in future research. Broad community participation and social mobilization are central to the success of complex health interventions and community-based interventions are promising and should be encouraged . However, the complexity of community-based interventions and questions of sustainability of community participation requires a comprehensive evaluation strategy with both quantitative and qualitative data collection. Given that few studies in our review addressed the long-term sustainability of community-based interventions, several questions remain and more research is needed [85, 86]. Increased eco-health research is needed to understand ecologically sustainable measures, such as non-impregnated nets to cover water containers and non-toxic alternatives , given the increased concerns of insecticide resistance  and human health consequences from acute and chronic exposure to chemical agents [88–91]. There is a critical need for researchers to report the methodology and the context of interventions clearly and completely to enhance the comparability of studies and the transferability of effective interventions to other locations and contexts. Checklists such as TIDieR  and ASTAIRE  are valuable standardized tools whose use should be encouraged and could conceivably become a publication requirement. Finally, there was minimal mention of theoretical frameworks being used for interventions, nor of the associated tools used, such as educational materials or workshops. Both researchers and stakeholders would benefit from theory-based approaches (and evaluation) to VBD interventions, which would be helpful in identifying successful and unsuccessful elements of an intervention . Several studies concluded that single-component interventions, such as use of insecticides, must be considered as one of the available measures for VBDs prevention, but not the only one . Multiple-component community-based interventions, such as environmental management, education, and social mobilization, are promising in their potential to achieve wide coverage and sustainability but require significant partnerships between major stakeholders . Local customization of interventions has been shown to be an important factor for strong community engagement . Community-based interventions are not simple to design and implement, and time is required to establish robust and trusting intersectoral partnerships. Yet, as Raju (2003) cautioned, if community participation is viewed as a means to shift responsibility and costs from government to residents without providing adequate services to support residents, the likelihood of sustainability is very small . As health education is a fundamental component, particularly in settings where literacy levels may be lower, careful consideration must be given to the educational approach and materials. These principles are not new in health education research  and underscore the need to engage with health education experts. Active engagement, ownership, and understanding of those materials by the community are important factors to take into consideration, and the diverse stakeholders each have a role to ensure those materials are adequate. Higher quality research and standard reporting of interventions are necessary if we are to successfully control in VBDs. The findings from this review included recommendations for devoting longer times to follow-up, combining human and entomological indicators in evaluating interventions, conducting more qualitative research, and using standardized tools to report intervention methods. More implementation research is needed to better understand what vector control interventions work in which contexts and, importantly, why and how. Interventions involving horizontal approaches, community participation, and social mobilization show potential, all precautions kept due to potential bias and limitations of the present review, and require sustained intersectoral collaborations between government sectors and communities to be successful. Conduct research to include sanitation and waste management. Include more systematically indicators of human morbidity, acceptability, sustainability and implementation indicators in intervention evaluations. Develop qualitative research and implementation research. Conduct research on ecological sustainable measures to control vector populations. Use and adopt high quality standards for reporting of interventions. Generate theory-based interventions and tools. Promote sanitation improvements as an integrated disease management strategy. Redirect vertical programs towards community-based programs and intersectoral partnership. Consider the time and resources required to successfully implement complex interventions. Ensure ownership and understanding of educational materials by the community and implement interventions based on relevant health education theory. Reduce dependence on chemical insecticides to curb growing resistance to insecticides by adopting an eco-health perspective. In the context of low resource settings, may need to prioritize the most vulnerable populations. We would like to thank Sylvie Fontaine, public health research librarian at the University of Montreal, for her careful review of the search strategy; Navdeep Kaur and Diane Dondbzanga for their involvement in the databases searches and studies selection; Stefany Idelfonso for help in selecting and extracting data from Spanish-language papers; and Mariam Otmani del Barrio, from the Unit on Vectors, Environment and Society at TDR (Special Program for Tropical Diseases Research and Training), for her comments on our final manuscript. This study was conducted as part of the VERDAS consortium project, funded by TDR hosted by the World Health Organization (WHO) and sponsored by the United Nations Children’s Fund (UNICEF), the United Nations Development Programme (UNDP), the World Bank, and WHO. VR holds a CIHR-funded Research Chair in Applied Public Health (CPP-137901). SD, KZ and VR defined the research question, identified and selected the relevant studies. SD extracted the data and summarized the data and wrote the draft. SD, KZ and VR reviewed the article and approved the final version. The study protocol was approved by the Health Research Ethics Committee of the University of Montreal (No. 16–049-CERES-D). National Academies of Sciences, Engineering, and Medicine. Global Health Impacts of Vector-Borne Diseases: Workshop Summary. In Washington, DC: National Academies Press; 2016. Available from: http://www.ncbi.nlm.nih.gov/books/NBK355538/. Accessed 10 Aug 2018. World Health Organization. A global brief on vector-borne diseases [Internet]. Geneva; 2014. Report No. : WHO/DCO/WHD/2014.1. Available from: http://apps.who.int/iris/bitstream/10665/111008/1/WHO_DCO_WHD_2014.1_eng.pdf. Accessed 10 Aug 2018. Gurtler R., Garelli F.M., Coto H.D. Effects of a five-year citywide intervention program to control Aedes aegypti and prevent dengue outbreaks in Northern Argentina. PLoS Negl Trop Dis [Internet]. 2009; Available from: http://www.plosntds.org/article/fetchObjectAttachment.action?uri=info%3Adoi%2F10.1371%2Fjournal.pntd.0000427&representation=PDF. Accessed 10 Aug 2018.
WHO | Core vector control methods [Internet]. WHO. Available from: http://www.who.int/malaria/areas/vector_control/core_methods/en/. Accessed 10 Aug 2018. United Nations. United Nations. World Urbanization Prospects: The 2003 Revision-a report [Internet] 2003. Available from: http://www.un.org/esa/population/publications/wup2003/WUP2003Report.pdf. Accessed 10 Aug 2018. UNICEF, WHO. Progress on sanitation and drinking water: 2015 update and MDG assessment [Internet]. Switzerland: WHO Press; 2015. Report No. : ISBN 978 92 4 150914 5. Available from: https://www.wssinfo.org/fileadmin/user_upload/resources/JMP-Update-report-2015_English.pdf. Accessed 10 Aug 2018. WaterAid. Off-track, off-target Why investment in water, sanitation and hygiene is not reaching those who need it mos. 2011. Available from: https://sustainabledevelopment.un.org/getWSDoc.php?id=2433. Degroote S, Bermudez-Tamayo C, Ridde V. Approach to identifying research gaps on vector-borne and other infectious diseases of poverty in urban settings: scoping review protocol from the VERDAS consortium and reflections on the project's implementation. Infect Dis Poverty. 2018. https://doi.org/10.1186/s40249-018-0479-3. WHO | Vector-borne diseases [Internet]. WHO. Available from: http://www.who.int/mediacentre/factsheets/fs387/en/. Accessed 10 Aug 2018. Population Division - United Nations. 2014 Revision of World Urbanization Prospects [Internet] 2014. Available from: https://esa.un.org/unpd/wup/. Accessed 10 Aug 2018.
WHO | Infection control [Internet]. WHO. Available from: http://www.who.int/topics/infection_control/en/. Accessed 10 Aug 2018. OECD Glossary of Statistical Terms - Housing unit Definition [Internet]. Available from: https://stats.oecd.org/glossary/detail.asp?ID=1263. Accessed 10 Aug 2018.
WHO | Hygiene [Internet]. WHO. Available from: http://www.who.int/topics/hygiene/en/. Accessed 10 Aug 2018.
WHO | Sanitation [Internet]. WHO. Available from: http://www.who.int/topics/sanitation/en/. Accessed 10 Aug 2018. Hoffmann TC, Glasziou PP, Boutron I, Milne R, Perera R, Moher D, et al. Better reporting of interventions: template for intervention description and replication (TIDieR) checklist and guide. BMJ [Internet]. 2014;348. Available from: http://www.bmj.com/content/348/bmj.g1687.abstract. Accessed 10 Aug 2018. Ocampo CB, Mina NJ, Carabali M, Alexander N, Osorio L. Reduction in dengue cases observed during mass control of Aedes (Stegomyia) in street catch basins in an endemic urban area in Colombia. Acta Trop. 2014;132:15-22. https://doi.org/10.1016/j.actatropica.2013.12.019. Marquetti MD, Bisset J, Suárez S, Pérez O, Leyva M. Drinking troughs for animals: containers that should be taken into account for the Aedes aegypti Control Program in urban areas of the City of Havana, Cuba. [Internet]. Bebederos de animales: depositos a tener en cuenta por el Programa de Control de Aedes aegypti en areas urbanas de Ciudad de La Habana, Cuba. Rev Cubana Med Trop. 2006;58(1):40-3. Available from: http://scielo.sld.cu/pdf/mtr/v58n1/mtr07106.pdf. Accessed 10 Aug 2018. Suman Saurabh, Veerakumar AM, Kalaiselvi S, Palanivel C. Effectiveness of individual health education on the practice of dengue fever prevention in an urban area of Puducherry, India. [Internet]. Indian J Community Health. 2014;26(4):434-7. Available from: http://www.iapsmupuk.org/journal/index.php/IJCH/article/view/453. Accessed 10 Aug 2018. Abeyewickreme W, Wickremasinghe AR, Karunatilake K, Sommerfeld J, Axel K. Community mobilization and household level waste management for dengue vector control in Gampaha district of Sri Lanka; an intervention study [internet]. Pathogens Global Health. 2013;106(8):479-87. Available from: https://www.tandfonline.com/doi/abs/10.1179/2047773212Y.0000000060. Accessed 10 Aug 2018. Pengvanich V. Family leader empowerment program using participatory learning process for dengue vector control [internet]. J Med Assoc Thai. 2011;94(2). Available from: http://www.thaiscience.info/Journals/Article/JMAT/10743570.pdf. Accessed 10 Aug 2018. Sanchez L, Perez D, Alfonso L, Castro M, Sanchez LM, Van Der Stuyft P, et al. A community education strategy to promote participation in dengue prevention in Cuba [internet]. Rev Panam Salud Publica/Pan Am J Public Health. 2008;24(1). Available from: http://www.scielosp.org/pdf/rpsp/v24n1/v24n1a08.pdf. Accessed 10 Aug 2018. Castro MC, Tsuruta A, Kanamori S, Kannady K, Mkude S. Community-based environmental management for malaria control: evidence from a small-scale intervention in Dar Es Salaam, Tanzania. Malar J. 2009;8:57. https://malariajournal.biomedcentral.com/articles/10.1186/1475-2875-8-57. Wagatsuma Y, Alam MS, Fukushige M, Islam MZ, Itoh M, Mondal D, et al. Neem extract as a control tool for vector-borne diseases: an example of visceral leishmaniasis in Bangladesh. [Internet]. Biopesticides International. 2009;5(2):134-140. Available from: https://www.cabdirect.org/cabdirect/abstract/20103122105. Accessed 10 Aug 2018. Moosa-Kazemi SH, Yaghoobi-Ershadir MR, Akhavan AA, Abdoli H, Zahraei-Ramazani AR, Jafari R, et al. Deltamethrin-impregnated bed nets and curtains in an anthroponotic cutaneous leishmaniasis control program in northeastern Iran. [Internet]. Annals of Saudi Medicine. 2007;27(1):6-12. Available from: http://www.annsaudimed.net/index.php/vol27/vol27iss1/4674.html. Accessed 10 Aug 2018. Castro M., Quintana N., Quinones P M.L. Evaluating two pyrethroids in dengue vector control in Putumayo, Colombia. Rev Salud Publica [Internet]. Rev Salud Publica. 2007;9(1):106-16. Available from: https://scielosp.org/scielo.php?script=sci_arttext&pid=S0124-00642007000100011&lng=en&nrm=iso&tlng=en. Accessed 10 Aug 2018. Farajollahi A, Healy SP, Unlu I, Gaugler R, Fonseca DM. Effectiveness of ultra-low volume nighttime applications of an Adulticide against diurnal Aedes albopictus, a critical vector of dengue and chikungunya viruses [internet]. PLoS ONE. 2012;7(11):e49181. Available from: http://www.plosone.org/article/fetchObjectAttachment.action?uri=info%3Adoi%2F10.1371%2Fjournal.pone.0049181&representation=PDF. Accessed 10 Aug 2018. Nagpal B.N., Ghosh S.K., Eapen A., Srivastava A., Sharma M.C., Singh V.P., et al. Control of Aedes aegypti and Ae. Albopictus, the vectors of dengue and chikungunya, by using pheromone C21 with an insect growth regulator: Results of multicentric trials from 2007–12 in India [Internet]. J Vector Borne Dis. 2015;52(3):224-31. Available from: http://mrcindia.org/journal/issues/523224.pdf. Accessed 10 Aug 2018. Arunachalam N, Tyagi BK, Samuel M, Krishnamoorthi R, Manavalan R, Tewari SC, et al. Community-based control of Aedes aegypti by adoption of eco-health methods in Chennai City, India. Pathog Glob Health. 2012;106(8):488-96. https://www.tandfonline.com/doi/full/10.1179/2047773212Y.0000000056. Accessed 10 Aug 2018. Caprara A, Lima JWO, Peixoto ACR, Motta CMV, Nobre JMS, Sommerfeld J, et al. Entomological impact and social participation in dengue control: a cluster randomized trial in Fortaleza, Brazil [internet]. Trans R Soc Trop Med Hyg. 2015;109:99–105. Available from: http://trstmh.oxfordjournals.org/content/109/2/99.full.pdf. Accessed 10 Aug 2018. Quintero L, Lopez MB, Ramirez H, Castano JC. Outbreak of malaria in an indigenous population living in an urban area of Armenia, Colombia, 2012. [Internet]. Descripcion de un brote epidemico de malaria en una comunidad indigena asentada en la zona urbana de Armenia, Colombia, 2012. Biomedica. 2015;35(1). Available from: http://www.scielo.org.co/scielo.php?script=sci_arttext&pid=S0120-41572015000100005. Accessed 10 Aug 2018. Toaliu H, Taleo G. Formation of Community Committees to Develop and Implement Dengue Fever Prevention and Control Activities in Vanuatu. Dengue Bulletin. 2004;28(2004 Suppl). Available from: http://apps.who.int/iris/bitstream/handle/10665/164005/dbv28supplp53.pdf?sequence=1. Accessed 10 Aug 2018. Che-Mendoza A, Guillermo-May G, Herrera-Bojorquez J, Barrera-Perez M, Dzul-Manzanilla F, Gutierrez-Castro C, et al. Long-lasting insecticide-treated house screens and targeted treatment of productive breeding-sites for dengue vector control in Acapulco, Mexico [internet]. Trans R Soc Trop Med Hyg. 2015;109(2):106-15. Available from: https://academic.oup.com/trstmh/article/109/2/106/1920271. Accessed 10 Aug 2018. Bodner D, LaDeau SL, Biehler D, Kirchoff N, Leisnham PT. Effectiveness of print education at reducing urban mosquito infestation through improved resident-based management [internet]. PLoS One. 2016;11(5):e0155011. Available from: http://journals.plos.org/plosone/article?id=10.1371/journal.pone.0155011. Accessed 10 Aug 2018. Healy K, Hamilton G, Crepeau T, Healy S, Unlu I, Farajollahi A, et al. Integrating the public in mosquito management: active education by community peers can lead to significant reduction in peridomestic container mosquito habitats. PLoS One. 2014;9(9):e108504. http://journals.plos.org/plosone/article?id=10.1371/journal.pone.0108504. Tranchida MC, Pelizza SA, Bisaro V, Beltran C, Garcia JJ, Micieli MV. Use of the neotropical fish Cnesterodon decemmaculatus for long-term control of Culex pipiens L. in Argentina. [Internet]. Biol Control. 2010;53(2);183-7. Available from: https://www.sciencedirect.com/science/article/pii/S1049964409002965. Accessed 10 Aug 2018. Fimia Duarte R, Castillo Cuenca JC, Cepero Rodriguez O, Corona Santander E, Gonzalez Gonzalez R. Effectiveness of the mosquito larvae control (Diptera: Cullicidae) by larvivorous fish. [Internet]. Eficacia del control de larvas de mosquitos (Diptera: Culicidae) con peces larvivoros. Rev Cubana Med Trop. 2009;61(2). Available from: http://scielo.sld.cu/scielo.php?script=sci_arttext&pid=S0375-07602009000200012&lng=en&nrm=iso&tlng=es. Accessed 10 Aug 2018. Abramides GC, Roiz D, Guitart R, Quintana S, Guerrero I, Gimenez N. Effectiveness of a multiple intervention strategy for the control of the tiger mosquito (Aedes albopictus) in Spain. Trans R Soc Trop Med Hyg. 2011;105(5):281-8. https://doi.org/10.1016/j.trstmh.2011.01.003. Ensink JHJ, Mukhtar M, van der Hoek W, Konradsen F. Simple intervention to reduce mosquito breeding in waste stabilisation ponds. [Internet]. Trans R Soc Trop Med Hyg. 2007;101(11):1143-6. Available from: https://academic.oup.com/trstmh/article/101/11/1143/1879878. Accessed 10 Aug 2018. Pronk NP, Hernandez LM, Lawrence RS. An Integrated Framework for Assessing the Value of Community-Based Prevention: A Report of the Institute of Medicine. Prev Chronic Dis [Internet]. 2013;10. Available from: http://www.ncbi.nlm.nih.gov/pmc/articles/PMC3604799/. Accessed 10 Aug 2018. Reiner RC, Achee N, Barrera R, Burkot TR, Chadee DD, Devine GJ, et al. Quantifying the Epidemiological Impact of Vector Control on Dengue. PLoS Negl Trop Dis [Internet]. 2016;10(5). Available from: http://www.ncbi.nlm.nih.gov/pmc/articles/PMC4881945/. Accessed 10 Aug 2018. Ridde V, Robert E. Real World Evaluation Strategies [Internet]. Oxford Bibliographies; 2014. (Public Health). Available from: https://doi.org/10.1093/obo/9780199756797-0140. Accessed 10 Aug 2018.
WHO. Global vector control response 2017–2030. [Internet] Available from: http://www.who.int/vector-control/publications/global-control-response/en/. Baingana FK, Bos ER. Changing patterns of disease and mortality in sub-Saharan Africa: an overview. In: Jamison DT, Feachem RG, Makgoba MW, Bos ER, Baingana FK, Hofman KJ, et al., editors. Disease and mortality in sub-Saharan Africa [internet]. 2nd ed. Washington (DC): World Bank; 2006. Available from: http://www.ncbi.nlm.nih.gov/books/NBK2281/. Accessed 10 Aug 2018.